I tried hard to find out how Honeymoon Beach got its name, and I suppose it’s just something related to going to St. Thomas on your honeymoon and hanging out at this beach. Does anyone know for sure? Contact us here and we’ll update this entry. What you will find here is something we won’t let honeymooners keep all to themselves. This is one pristine slice of the Island that if you can, you want to get out to and simply take in. Let the locals show you a good time here and if you have the time, take them up on a few of the excursions that are run around this area. You never know who you might see out here. That’s the magic of the USVI, however we’re finding more and more that people are discovering the beaches and little islands off of the main islands here and spending more time there. This is driving some of the business away from places like Water Island here. 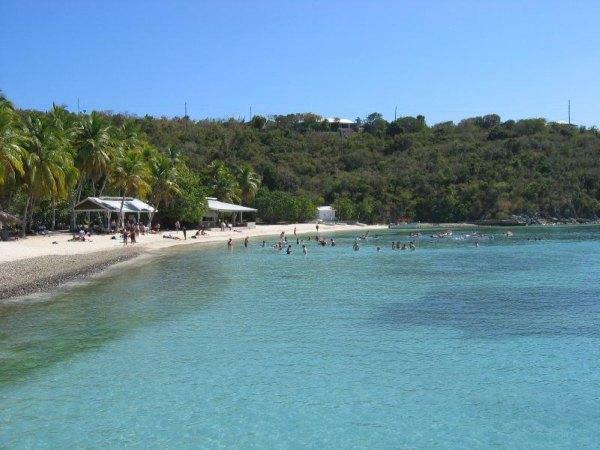 If you want a little get-a-way, off the beaten path trip to a great beach, Water Island lies just offshore from capital city, Charlotte Amalie. It’s the fourth-largest island of the U.S. Virgin Islands and has a dreamy beach to die for. 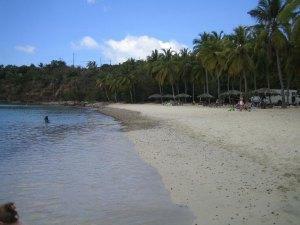 Shaded by palm trees that line the beach, Honeymoon Beach is perfect for swimming because there is little wave action. But you can also snorkel here, as well. The huts here rent out sailing boats, snorkel gear, and swim floats. On weekends, a canteen is open with lunch and drinks! It’s a perfect way to spend a day in St. Thomas paradise (actually, Water Island). To get here, simply head for the Crown Bay Marina. Catch the ferry to Water Island – about $5 one-way. There are several ferries a day – you’ll see the schedule posted at the marina. Sand – medium grain/white from coral. Shade – both palm trees and umbrellas. Sports – swimming, There are NO snorkel or float rentals, but a recently-started kayak rental business is offering use of snorkel equipment to its customers (Water Island Kayaks, 340-227-6804 for more info). No other snorkel gear is available. Notes – don’t get left behind. Make sure you know the ferry schedule. Heidi’s Honeymoon Grill serves food and beverages on Saturdays and Sundays frm about 10:30 AM till 5 PM. The original hotel on Water Island was started by Walter Philips. At that time the islands were served by DC-3’s and tourism was relatively limited to “newly wed’s and nearly dead’s”. Walter cleaned up Druif Bay, planted the palms, brought in sand, converted army barracks into a hotel and got his story in LIFE magazine. He named the beach Honeymoon, to attract both generations and succeeded in selling leases to many of those who came and fell in love.